The Gospel of St. John is a testament of beauty but it is not always very easy to understand. Consider for a moment that in most major seminaries, the three other Gospels, known as the synoptic gospels, are taught together in one course. The writings of St. John are so rich and so complex that these alone are more than enough to constitute their own separate course. Today's Gospel reading is a clear example of how incredibly rich the writings of St. John are and that there is so much to ponder in this reading than what is plainly obvious - the story of the healing of a man born blind. At the beginning of our Gospel today the disciples ask the Lord whose sin was responsible for the blindness of the man born blind - the man himself or his parents. The Jews believed that disease and other infirmities were direct punishment from God for sin committed. Catholics have a different view. While we recognize that it was original sin that introduced sickness and disease into the world, we also know that God does not inflict or allow evils to happen in direct proportion to every sin committed, as if personal sin is always the immediate cause of misfortune or illness. Part of the reason we know this is because our Lord suffered immensely and endured great injustices in spite of the fact that He knew no sin and was born of a sinless woman, our Lady. 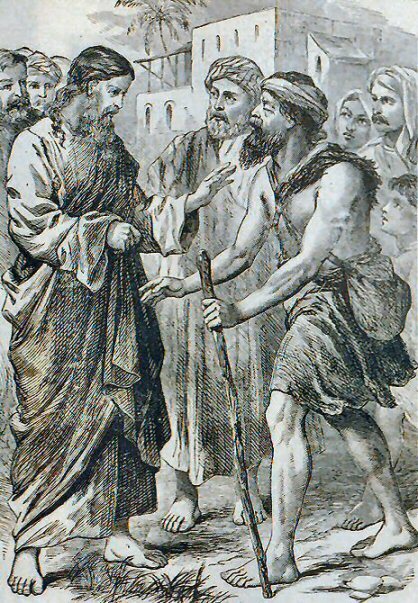 Jesus assures his disciples that God can and does work His will in the world in spite of disease and misfortune and that He is about to do so in the case of the man born blind. On a larger scale, when He proclaims that He is the light of the world, our Lord is telling us that His life here on earth gives us the ultimate meaning of the world, of the life of every person and of mankind as a whole. In the cure of the man born blind, we not only witness a historical event, but we also learn more about the struggle to overcome sin that occurs in the heart of every human person that truly seeks God. The healing of the blindness is done in two stages: First, Jesus applies clay made with His saliva on the man born blind. Second, Jesus orders the man to wash in the pool. St. Ambrose tells us that by applying the clay made with the saliva of the Lord, Jesus is reminding us that God, who restores the man born blind to health by anointing the eyes with clay is also the same God who created Adam and Eve out of clay and that this clay, which is symbolic of our flesh, can receive the stream of eternal life through the sacrament of baptism and the sacrament of penance. By washing in the Pool of Siloam, which the prophets believed had divine power, our Lord reminds us again that the human person, often blinded in sin, is in need of regeneration and cleansing, found in the sacraments. Like in the sacraments themselves, our Lord uses earthly materials to convey grace and healing. For example, a priest offering Mass must have matter to consecrate - he must have unleavened bread and wine co-mingled with water in order to confect the sacrament. He simply can't say prayers and hope that a sacrament is confected. Similarly, our use of bells and incense engages the whole body in prayer. Christ knows this about us and our need for real matter - that's another reason why he uses clay to anoint the eyes of the man born blind. When we consider the connection between clay and flesh, we observe that every human person is born blind with the blindness that original sin passes onto us. It is Baptism that washes away that sin and then the Sacrament of Penance that heals actual sins committed after baptism. We ought to marvel at the faith of the man born blind - surely he must have thought that using an expensive medication or treatment would have cured his infirmity. Instead, we learn that it is his faith that cures him. Faith can move mountains, says the Lord and in this case, the firm and operative faith of a man born blind is his salvation. They say that seeing is believing. In this case, believing is seeing. Make no mistake - St. John compares faith to sight - the capacity to penetrate the mysteries of God and to really believe in His power to heal our sins. After the man born blind is cured, St. John tells us about different reactions to the miraculous healing. The healing causes confusion among those who know the man born blind, his neighbors. The same could be said for someone who has come back to the Sacrament of Penance after many years - life has begun anew for that person. It can and should inspire the penitent to seek a new way of living, so much so, that they may even become somewhat unrecognizable to those around them. St. Paul even tells us when describing his conversion, "It is no longer I who live, but Christ who lives in me." The healing also causes division among the Pharisees. They persist in not wanting to see or to believe, in spite of clear evidence of a miracle. Rather than accept Jesus, the Pharisees would rather level accusations of breaking the Sabbath against Him. They refuse to listen to our Lord, who is teaching them that authentic acts of charity takes precedence over all of the Commandments. When mere adherence to rules without regard for charity becomes the mode of operation, fanaticism is the result. The Pharisees are so locked into the Law, that they have to conclude that Christ must be a sinner because He does acts of charity on the Sabbath. It's as if the Law has become it's own end, without regard to the essence of the Law - love of God and neighbor. When the parents of the man born blind are brought in, they cower under the craving for human respect and the relative safety of not bearing witness to Christ. Isn't this in fact the experience of the penitent who has been reborn in the Sacrament of Penance? Outsiders are suspicious that a real healing has occurred and there's a temptation to deny that God really can and does work miracles in our lives when we confess our sins. The temptation is to cower under the desire for human respect and either return to our former way of life or pretend that Confession has really not done anything for us, as if God were powerless to really change us. Then, the Pharisees call-in the man born blind a second time and they tell him to "Give God the praise!" This is a Jewish exhortation to tell the truth. The Pharisees, incredulous at our Lord's capacity to heal, think that the man born blind is lying about his healing. They tell him to tell the truth about what happened but it is clear that they are not looking for the truth - they want to intimidate the man born blind into retracting his statement that Jesus healed him. Yet, the man born blind remains steadfast - he's a straight forward guy. In spite of ridicule and his eventual expulsion from the synagogue and all that is sacred to a Jew, the man born blind is now a believer in the Lord Jesus. He does not doubt the Lord. That is the type of steadfastness that every penitent who leaves the Confessional ought to want - that steeled resolve to remain faithful to Christ, in spite of ridicule, in spite of the cost of discipleship, no matter how big or small that may be. Lastly, we have the dramatic second encounter between the Lord and the man born blind, now cured. Earlier in the passage, the man born blind regarded Jesus as only a prophet. Now, he recognizes and worships our Lord's divinity. Meanwhile, the Pharisees have gone in an opposite direction - growing even more obstinate in their unbelief as the story unfolds. Jesus states earlier in John 3:17 that He has not come to condemn the world but to save it. In this passage, the Lord says that He has come for judgment. Is this a contradiction? Not at all. Our Lord says that he has come for judgment because His presence among us already involves a judgment on our part since each of us has to take a stand whether to reject or accept Him. Our Lord's coming implies the fall of some and the salvation of others. Those who will be saved are those who admit their sins and seek our Lord's forgiveness. These are the people who see with divine faith. Those who will not be saved are those who are satisfied with themselves and think that they do not need Christ or his world. These are the people who say that they see but are in fact really blind. So, we ourselves decided our ultimate fate, depending on whether or not we see or remain blind in sin. Even the Pharisees want to know what category they fall into. Our Lord's words must have stung them to the heart. He says that because they claim to be able to see, they are in fact blind in their pride and their inability to recognize their own hardness of heart. Paradoxically, it is those who claim to be blind that are in fact those who truly see - they see that only Christ, who is the light of the world, can truly give them the vision they need to recognize their sins, to confess them with contrition, to desire not to want to sin again and to live in the freedom and the glory of the children of God.